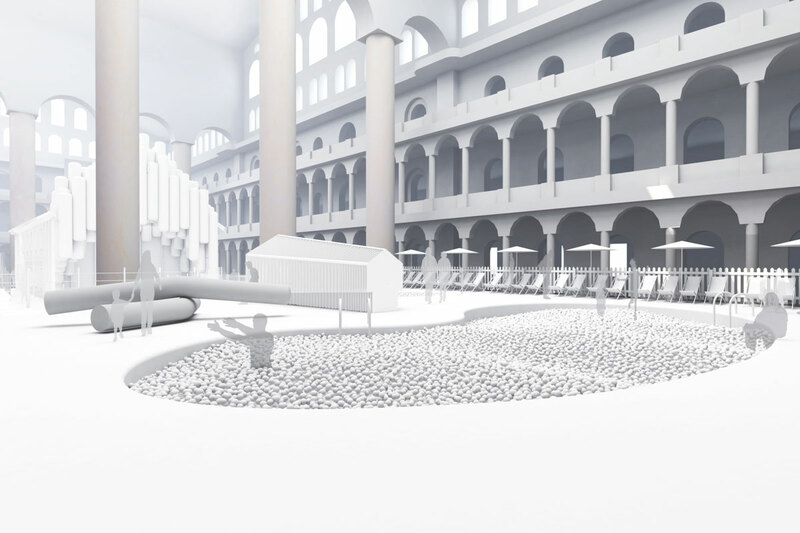 This summer, the National Building Museum presents a new, interactive exhibition designed by Snarkitecture. Titled Fun House, it is the latest in the Museum’s imaginative Summer Block Party series of temporary structures inside its historic Great Hall. Complemented by a full schedule of programs and special events, Fun House opens July 4 and runs through September 3, 2018. Fun House is Snarkitecture’s first comprehensive museum exhibition, examining the prolific activities of the studio throughout the entire Great Hall. Curated by Italy-based Maria Cristina Didero, the heart of the exhibition is presented within a Snarkitecture-designed house—a freestanding structure that recalls and re-imagines the idea of the traditional home. Fun House includes a sequence of interactive rooms featuring well-known Snarkitecture environments and objects, like Dig (2011) and Drift (2012), as well as new concepts developed for the Museum. As visitors walk through the house, the rooms convey the ten year story of Snarkitecture while underlining the studio’s peculiar, yet accessible way of reinterpreting the built environment. In the Museum’s west court, or “front yard,” a custom recreation of A Memorial Bowing (2012), welcomes visitors into the space. Visitors exit the house towards the east court, or “backyard,” greeted by Playhouse (2017) and a kidney-shaped pool filled with hundreds of thousands of recyclable plastic balls, reminiscent of The BEACH (2015-17). Fun House is complemented by a full slate of events and exhibitions. Visit www.nbm.org for more information about summer programming. Fun House is generously supported by AARP; CoStar Group, Inc.; and HDR, Inc., with special thanks to Caesarstone, DPR Construction, and Phaidon. Renderings are available at go.nbm.org/funhousepress. Caption and crediting information is provided in the same folder. Final installation photography will be available July 5. Admission includes one hour of timed entry in Fun House. Starting June 20, visit go.nbm.org/tickets for more information and to reserve your time slot. Maria Cristina Didero is an independent curator and freelance writer, based in Milan and working internationally. She collaborates on a regular basis with Domus and Vogue Italia, and she runs a monthly column on icon Design called “L’Ascensore.” Didero has curated numerous exhibitions in public and private institutions worldwide, contributing to several publications.